Right where Cal Lutheran’s main campus meets the neighborhood to the east, grounds-keepers will install native plants in a teaching garden designed not just to save water, but also to offer choices for homeowners who are ready to remake their yards. With a $33,000 grant from California American Water, the local water purveyor, Cal Lutheran this winter will replace a block-long strip of grass on Mountclef Boulevard across from the Pederson and Thompson residence halls. In place of a sidewalk, Director of Facilities Management Mark Jacobsen envisions a path of decomposed granite that meanders through the plant life. The idea is a little botanical garden with nothing exotic in it – just some of the ground cover that lived in California before our lawns did. Jacobsen and his crew also plan to assist with a separate project immediately outside of Ahmanson Science Center: the creation of a laboratory for studying coastal sage scrub plants, the plant community found in the hills surrounding campus. Bryan Swig ’00, Ph.D., a specialist in marine wetlands who coordinates the science laboratory on the second floor of Ahmanson, won quick approval for his idea to expand lab space outdoors for students in botany and other biology courses. Both of these educational projects fit in nicely with efforts by Facilities to replace as much grass as possible on campus and with other water-saving measures that were instituted before the drought started, ranging from low-flow showerheads and toilets in the dorms to irrigation controllers that track the weather. While also trying to prevent cracks in the ground where student athletes run and where summer campers play, Facilities has allowed many patches of grass simply to go brown. 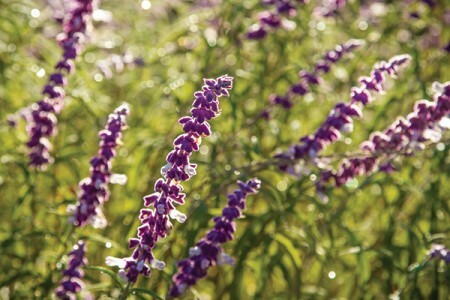 Drought-tolerant plants (not all of them native to California) are gradually becoming the dominant ground cover on the main campus, excluding sports fields and a few outdoor event venues such as Kingsmen Park. Ryan Van Ommeren, the associate vice president for facilities operations and planning, says that the conversion to lower-water plants will take at least another three years to complete. Landscaping that includes California lilac, Mexican sage and hummingbird sage, as well as gravel and other xeriscape, can now be seen, for example, outside of Preus-Brandt Forum, at houses used for office space and student services along Pioneer Avenue, and by the Swenson Center and Samuelson Chapel. Milkweed was put in around Nygreen Hall expressly to attract monarch butterflies, Jacobsen said. At the coastal sage scrub laboratory planned by Swig, students will have the opportunity systematically to work out what makes buckwheat and sagebrush feel at home, and also to test the plants’ limits by over- and under-watering and controlling exposure to sunlight. The local sage scrub plant community also includes some brush sunflower, prickly pear cactus and yucca.